Work on a £900,000 scheme to protect part of the Devon coast from flooding has caused a row because residents say it will affect washing lines. 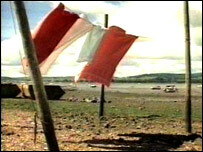 The Environment Agency said new sea defences at Lympstone were vital for the safety of more than 100 properties. Parts of the village are quite cramped and some residents have been hanging out their washing on the banks of the Exe for generations. The village was almost flooded by the River Exe during last October's storms. Flood waters came closer to some of the homes than many would have wished. Strengthening work on the village's flood defences began last month with six new flood gates and ramps currently under construction. However, some villagers such as Chris Binmore are not happy. She said: "I've no garden or anything. They did say they are going to reinstate the line. They promised us that, but time will tell." The Environment Agency has worked hard to diffuse concern about the possible loss of the washing lines. One woman has even been offered help with the cost of her tumble drying. Graham Buxton-Smith from the agency said he was not surprised by some people's priorities. He said: "They're a small community. Their everyday is important to them. They don't perhaps realise the danger of tidal events. "Not all of them see it. They're not always around when it actually happens but the ones who have seen it are quite reassured the scheme is going ahead." The flood defence scheme is due for completion in October.